I don't remember when I first met Mistress Nataliia, but she's an unforgettable figure in the Rapier and Scribal communities of the East Kingdom. While I don't recall when or how we first met (probably in the Rapier lists) I recall being quite intimidated as she attended a calligraphy class of mine held a few years ago during a Great Northeastern War in Malagentia. Partly this was because of my memory of the lovely and long Order of the Golden Rapier scroll she made for Jean du Montagne. More recently she's been experimenting with making her own period-style paintbrushes and testing them. She's one of the many people who inspired me to try this whole scribal thing out. Thanks Nataliia! Tell me a little about yourself and how you first got involved in the scribal arts in the SCA. I am Nataliia Anastasiia Evgenova. I originally started in Barony Beyond the Mountain in 1994/95. I started with a Russian personna in the late 16th century and have slightly changed my appearance to be more Elizabethan. My first foray with the SCA was fencing and I think I will always be known for that. Most of my awards, Pelican, Silver Crescent, Golden Rapier, Valiant Tyger, are all for my fencing or service to fencing. After a while I discovered there were other things besides fencing. I know, shocking! I had a friend coming up for an award, in 2001 and I asked if I could do his scroll. Duchess Katherine Stanhope was Tyger Clerk at the time and she said yes. I was thrilled. I look back and that scroll was very basic but the recipient always said he loved it, so that made me happy. I will say that Katherine's giving me a chance still means a lot to me. Once I started I just kept doing scrolls. I concentrated on fencing scrolls because that is where my interests lay and I did more research on later period scrolls. I moved around a bit, but now reside in the Barony of the Bridge. I have a Maunche for scribal arts. Did you have artistic experience prior to this involvement that has helped you? I attended the University of Rhode Island and have a dual B.A. degree in art studio and art history. I graduated from college in the early 80s and well, there was just no money in art jobs, so I set it aside for a while to work and have a family. I picked it back up in the SCA and that has made me very happy. I am primarily a painter/illuminator, but will often do my own words and calligraphy depending upon the needs of the assignment. I have a partner in crime in Mistress Eleanor Catlyn who will often do the calligraphy work for Peerage Scrolls or High Orders of Merit which need something special. My calligraphy is very working class. It gets the job done. It has improved over the years and I still continue to practice to get better. The best paper for all my work is Pergamenata, off white. It is very versatile and can take paint, ink, gold and keep on going. I have two favorites for writing, one is my Rotring Art Pen and for dip pens, I use Mitchell nibs. I go back and forth between these two for most of my work depending upon my mood and the needs of the work. My favorite ink right now is still in flux. I tend to use Higgins Eternal, but I haven't found one that truly makes me happy yet. Recently I have been interested in Alexandre's forays into testing different inks. My Ames lettering guide is absolutely necessary, as well as my T-square and metal ruler. I also have a light box that I could not live without. 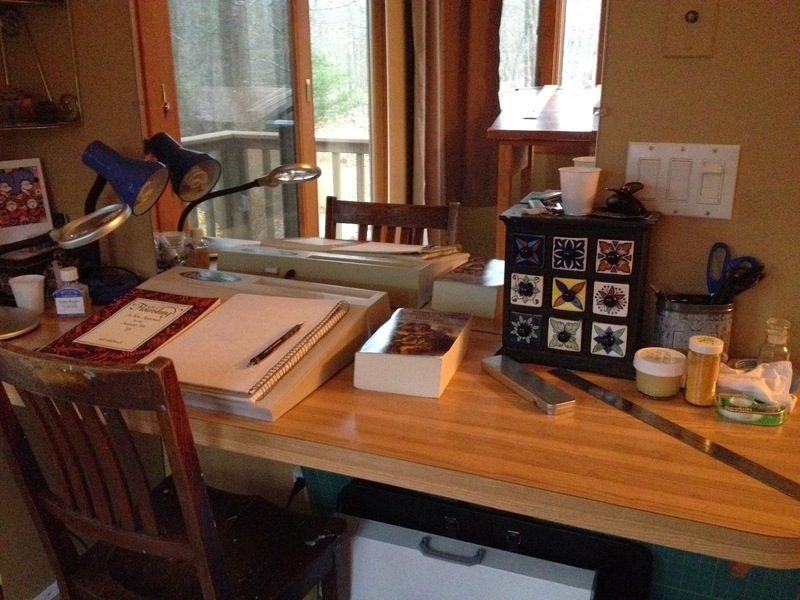 What does your calligraphy workspace look like? 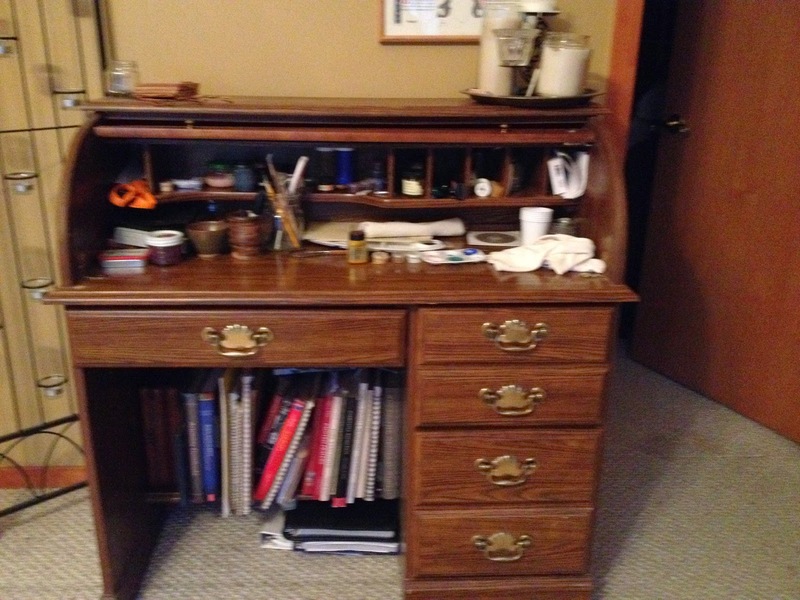 I have two art tables, one is a built in vanity style desk and the other is an old fashioned wood art desk that I picked up in a second hand store. 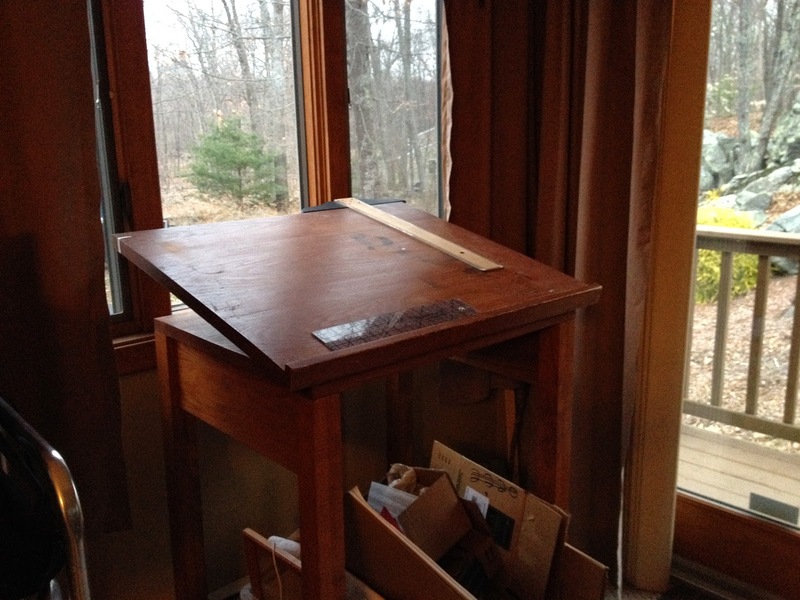 I also have an old roll top desk that I use for my art supplies. I have a decent Carolingian Miniscule, but I have also getting better at the early gothic style. I also love Cadells and am using "Calligraphic Flourishing - A New Approach to an Ancient Art" by Bill Hildebrandt in order to practice my flourishes and make my calligraphy have some nice splash. When I receive an assignment from the Tyger Clerk of the Signet in the East, I note several things, the persona of the person, their historical background, preferences, what the award is for and start doing research based on that. I might write to the person that recommended them to see if they wish to be involved in the wording or if there is someone who has called dibs on writing the words get that process started. If not I will start the process of getting the wording written. King's Order of Excellence for Aildreda, February 2014. 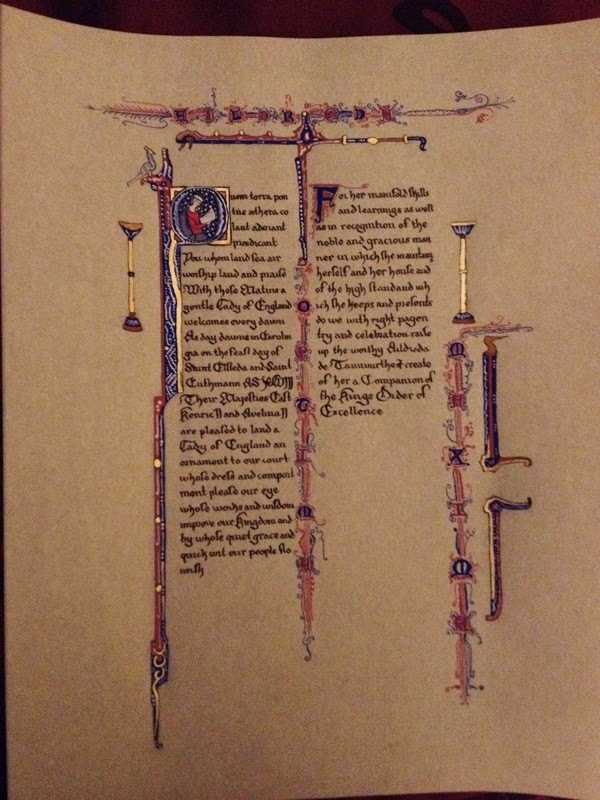 Calligraphy by Eleanor Catlyng, Words by Lucien de Pontivy, Illumination by Nataliia. I make a file for that assignment and start putting things into it, such as exemplars that I really like, pictures of the recipient, the award, ideas for webpage searches. I find pictures of the recipient either from the recommendation letter, from the East Kingdom Wiki, Google searches, or checking with my photographer friends who take pictures at events. I continue to do research and save them to my Diigo account for later reference. I will decide the style that I am going to pursue and then figure out if my calligraphy skills are up for the challenge. If not, I contact a calligrapher who will work with me. 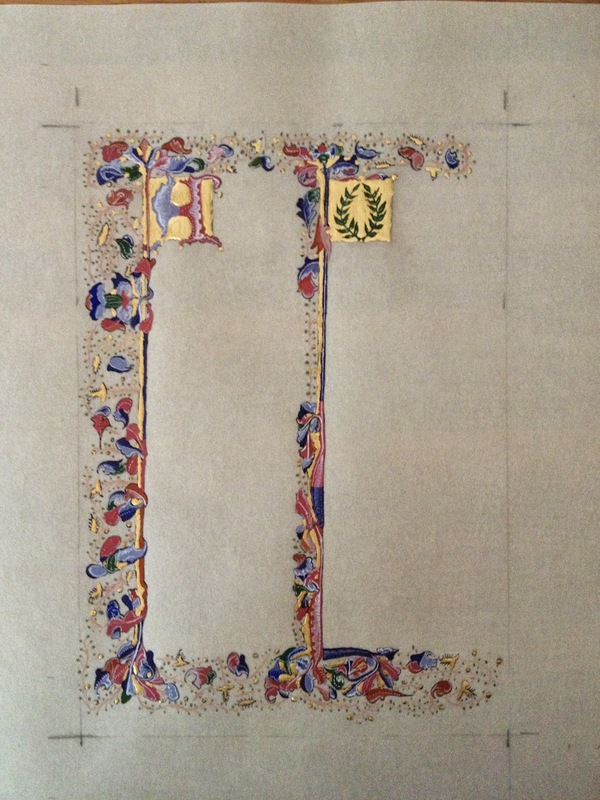 The calligrapher and I will meet in person to go over the style, matching the calligraphy to the illumination in both time and place, talk about layout quirks and come to a final decision about what the work will look like. We will determine how much space is needed for the wording and who will come up with the wording. If the wording isn't done, I will make a deadline for the wording. The calligrapher and I will then make a time table working back from when the assignment is due so that we know when things will need to be completed. Calligraphy goes first (most of the time) and the illumination goes last. If I am doing both the calligraphy and the illumination, I will still do a time table and block out the days that I need to work on the assignment in my calendar. At this point, I do the layout. I will do a couple of practice ones, using my light table for specific ideas, making sure that I am happy with the placement of the award and the design elements. I will tape the examplar that I am using, as well as the wording up on my mirror so that I can reference both of them during the process. When the wording is completed, I put it in a word document and do a letter count to make sure that it will fit in the space I have designed. Sometimes the wording needs to be re-worded to fit. I grab the pergamenata and do my final layout in pencil. Something new that I have been doing is to take process pictures during each step. Sometimes I get working so quickly that I forget, but I think that taking the pictures helps in seeing the pieces become the whole. After the layout is done, I put in the lines for the writing. I then hand it off to the calligrapher with a reminder of the deadline and wait. If I'm doing the calligraphy, I will block out twice as much time as I think I need to do the calligraphy just to be safe. I pull out an extra sheet of pergamenata and just do the layout for the calligraphy within the piece. This is my practice piece. It is very important to do the practice with all the same materials that you are going to use on the final piece. Once I have practiced enough I start on the calligraphy. I use white gloves that I have cut the thumb and forefinger off so that I don't get my skin oils on the final piece. I use the practice sheet to test the lines of my calligraphy pen so that I minimize blobs of ink. This doesn't always work and if I make a mistake, I will step away from the piece, let it dry and decide whether it can be scraped off with a exacto blade or whether I need to start over. Most of the time, it is easily scraped off of the pergamenata which is why I like that brand of paper so much. 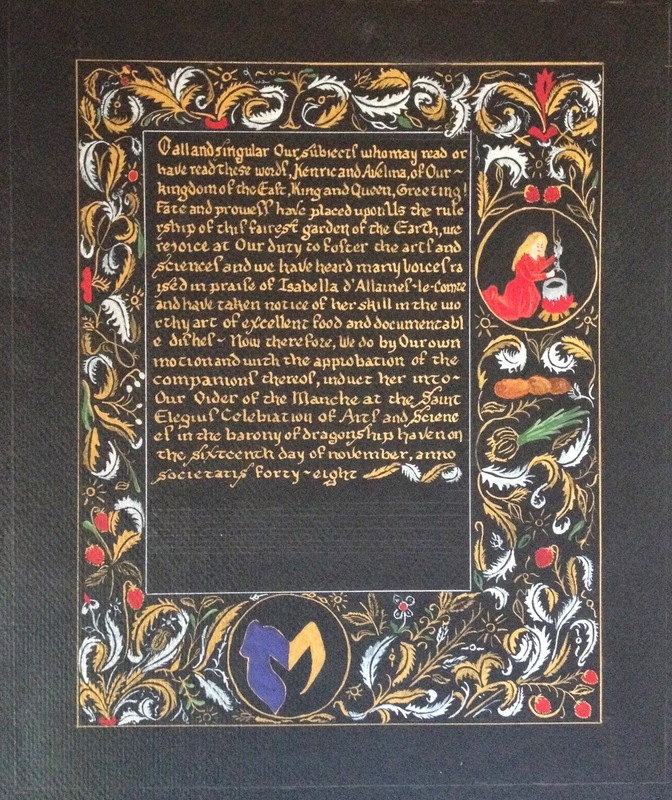 Laurel illumination for D'Unstable Pereginator, September, 2013.
before it was sent to Eleanor Catlyng for the calligraphy. Once the calligraphy is done, I will tape down the piece with blue painter's tape and let it dry and rest. I will then proceed with inking in my layout. After the inking, I will do gold leaf if that is what the project calls for. When the gold leaf is done, then painting starts. I pull out the colors (Holbein or Windsor Newton gouache or sometimes period pigments) that I have chosen and then start to color match the period example on another practice sheet. If I am using period pigments, prior to the color matching, I will spend some time grinding and mixing. I will also do some test patches to make sure that the mixture of gum arabic and pigment lay down correctly and don't dry out and flake. I will try to match the colors as closely as possible to the original and get the right consistency for the paint, it should have the consistency of cream. I will then work on one color at a time, usually starting with the blues, and make my ways to the darker colors. While I am working, I will use a magnifying glass to make sure that I have good color coverage. I will sometimes paint over the course of several days depending upon the project and reconstituting the paint as needed. The last colors that I use are white, burnt umber, grey or black for highlights and shading. Once I have completed the painting, I will leave the work taped to my desk with an upside down tray table over it. The upside tray table allows there to be air between it and the work, but also keeps it from being disturbed by the felines in residence, or accidentally getting marred by the numerous ways only a completed scroll can get into trouble. In a day or so I will look at it again and usually make some touch ups. I erase any lines that are still visible and look at it under a magnifying glass. I will sometimes make myself walk away from the project so that I don't overwork it. I then take pictures of the final project, sign the back attributing the collaborators, such as who wrote the wording, or did the calligraphy if it wasn't me. I will print out the cut sheet with the words, information about the original exemplar used for the piece and the contributors for the Court herald. I sometimes make two, with instructions that the Court herald give it to the recipient. I pack up the scroll in a scroll case and write a reminder note for myself to make sure it gets packed in the car for that event. I double and triple check this prior to leaving for the event. November, 2013, words, illumination and calligraphy by Nataliia. Marc Drogin's "Medieval Calligraphy - Its History and Technique" has been my old stand-by, however, recently I have been reading "Calligraphic Flourishing - A New Approach to an Ancient Art" by Bill Hildebrandt. I was lucky and purchased the book after I saw it on a friend's bookshelf. At the time I paid no more than fifteen dollars for it. Now the price runs anywhere from $160 to $300 for that book. I consider myself very lucky. I just purchased "Medieval and Renaissance Treatises on the Arts of Painting" and am very excited for some time to dig through this. As far as blogs, the other artists in my circles, Isabelle (Medieval Whimsies), & Alexandre [Thanks! -Alexandre] both do great work writing about their craft. For reference the British Medieval manuscripts blog is the best. I get it delivered to my email once a week. It is great for ideas. The deadlines. They help to make sure that I actually complete a project. The deadlines. Sometimes there isn't a lot of time from assignment to due date. It pushes one and sometimes you need more time to do the type of detailed work that you want to do. Get the best materials that you can afford so that you don't have to fight your materials. However, it has been a busy month so I haven't updated in a while. To buy the best materials that you can afford and keep looking at period examples.